No, ugh! My initial thinking was since it's a short stay we would enjoy RPC and a different park each morning and then a different park each night too so we can take in all the Christmas lights, etc. Now I'm thinking of booking MVMCP even though I said I wasn't going to. Then of course that leads to maybe I should book JBJB party because that would be something completely new to us. I just don't want to be gone from RPC too much because I really want to enjoy that too. I know, such tough problems Lol! Decisions! Decisions!! I completely agree... I think I’d want the freedom to be back at RPC to enjoy the food and especially the beautiful music at night. There’s something so peaceful about it! Can always do just one party? HBGdancermom, TJA, mickeynut1 and 1 other person like this. Haha.....fit me good, have never kept any though!!! ConnecticutNonna, HBGdancermom, PPFlight75 and 1 other person like this. Goodness best not mess with my chocolates....you get a nice chocolate totem pole with chocolate balls at the CL WL when you arrive....and little chocolates on the pillow at turndown each night..... This photo is a few years back...last trip it was fancier and the totem pole was in a fancy box on a bed of white and chocolate tiny balls...I forget the name of the chocolatier, The little square chocolates in gold foil below are on your pillow each night along with a Native American saying card, that make very handy bookmark memories! ConnecticutNonna, QueenElinor, HBGdancermom and 5 others like this. ConnecticutNonna, HBGdancermom and PPFlight75 like this. Last time I stayed CL @ AKL, Sue told me robes and chocolates were “by request”. ConnecticutNonna, PPFlight75, HBGdancermom and 3 others like this. ConnecticutNonna, PPFlight75 and mrsap like this. Ask and you shall receive.....guess it helps to not waste any of that precious commodity....could be an option on check in choices!! Speaking of club rooms at AKL. Did anyone ever get a room on the 6th floor? In one of those beautiful rooms on the same floor as the lounge? How does one get "promoted" up there? Those are the DVC club rooms, there are only a few and they are booked up by AKV owners right at 11 months usually. 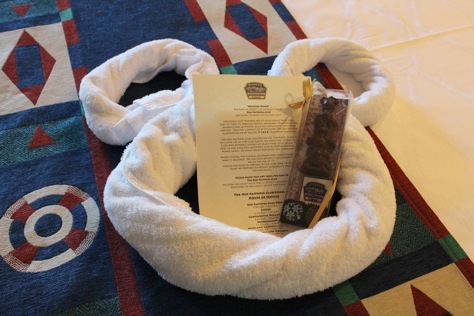 We stay in one of the AKL DVC CL rooms every year and we always have robes in the wardrobe, and chocolate at night, we got slippers once like 9 years ago. I knew I would get the correct answers here. Last time I stayed CL at AKL I was put on the 4th floor. I am going back to AKL soon and called Disney to inquire about the 6th floor rooms. The rep said she would put in a "request" but there are no guarantees. So it was all false hope! AngiTN and ConnecticutNonna like this. Oh my goodness, that is completely incorrect. All of the CL rooms on the 6th floor are DVC villas and all of the regular club level rooms are on the 4th floor that would be a giant waste of a request. AngiTN, ConnecticutNonna, Minnie1222 and 2 others like this. DD and I did 2 parties with our rpc stay in sept. We enjoyed the lounge as long as we wanted then headed over. We did miss desserts but with soup and scones during the day we spent most of our afternoon in and out of the lounge. We loved the quick 1 stop to the party and boat back too. Now for the dessert party to me seems overkill with rpc but some do do that. ConnecticutNonna, mickeynut1, DisneyLifePapioNe and 1 other person like this. So thanks to all for shared input on CL fastpasses ....I did email my requests the day prior, and although it did not get loaded the next morning or responded to, the CM at DSS was able to pull it up, work on it and call me back in about 15 minutes, so I didn't have to go step by step. I had mentioned I would like an overlap if possible on the lands back to back rides and they did a awesome job on that, most were done, think only one was spaced hour apart but I know from your vast knowledge here that I can simply time things to actually DO them back to back managing time slots. again to my fellow posters here! Now I still have two dates to 60 day my remaining days but WOO HOO much less work when that time comes around. Best thing of all I was able to get this done in the small time slot while the house was empty! No small feat.....got a tour booked and information on the Minnie vans as well. Guess I need to download a Lyft app but best wait as DH may inquire why it is on my phone since I have no need of such here. ConnecticutNonna, mickeynut1, PPFlight75 and 1 other person like this. Can you clarify what you mean by this? Do you mean they were able to overlap the fastpass’s hour windows? Like instead of 9-10 ride 1 & 10-11 ride 2, you were able to get 9-10 ride 1 & 9:30-10:30 ride 2 for example?? If so, that is something new & a pretty good advantage to the program. I used the program earlier this year & had to space everything an hour apart. Sure and I had read about the hour apart but also read some people overlapped when they got a good CM on the phone....so I asked my first DSS phone call and they said yes if available and if rides were right next to each other thingy....so in some cases they only overlapped by 15 minutes, the best was 30 minutes...like 10:00 and 10:30. In one case they said they could not do but anyhow it will work out....worth it to me. Then I was indeed able to modify my nonCL fast pass selections too. I would not have asked if I had not read about it. Might depend on the person you get too....but I would suggest emailing your request as I did, mention you have heard they CAN and have modified to overlap CLFP and indicate which ones you would like the timeframes closer together. YES that is a very good thing. Makes perfect sense, and since it is rather costly, and we no longer have the fireworks viewing area...WOOHOO!!!! ConnecticutNonna, mickeynut1, QueenElinor and 1 other person like this. Note to add when I emailed my FP wishes into DSS I asked for the times spaced apart one hour....then they tried to match up and overlap as much as possible. Thanks! I am considering booking them again for our Easter trip. But since we are in ours 60s, we rarely spend 6 hours in the parks. If I can get them overlapped it would make all the difference. ConnecticutNonna, mickeynut1 and gwynne like this.